Economic growth is expected to slow down somewhat in 2019 and 2020, mainly due to lower export growth and the cooling down of the Chinese economic cycle. The Malaysian population is an ethnic and religious mix of Muslim Malay and other indigenous groups (69%), Buddhist Chinese (24%), Hindu Indians (7%). Racial tensions have always simmered under the surface, but have not surfaced in over 40 years, thanks mainly to a massive affirmative action policy favouring ethnic Malays. However, this policy has hindered Chinese and Indian minorities in their social and economic progress. The continuation of this so-called ‘pro-bumiputra policy’ or the possible cutback of it, is one of the major political issues. In the May 2019 general election the Pakatan Harapan (PH) alliance of opposition parties gained 122 out of 222 seats. It surprisingly won against the The Barisan Nasional (BN) coalition led by the United Malays National Organisation (UMNO), which had been in power since Malaya achieved independence in 1957. Main reasons for BN´s defeat were the introduction of an unpopular goods-and-services tax (GST) of 6% in 2015 (in order to reduce the government’s dependence on oil revenues) and the involvement of former Prime Minister Najib in the so-called MDB financial mismanagement scandal (the disappearance of USD 4.5billion from a state development fund). The new government under Prime Minister Mahathir (who previously was UMNO leader and served as Prime Minister between 1981 and 2003) has abolished the GST tax, reintroduced certain fuel subsidies and cancelled or cut back some megaprojects initiated by the previous government, including pipelines built with Chinese help and a high-speed rail project planned with Singapore. The Malaysian economy is generally well diversified. While oil reserves are declining, production of natural gas has continued to climb rapidly and reserves are still substantial. The export sector is a major economic strength, but at the same time the heavy dependence on external trade makes the country vulnerable to fluctuations in global prices for energy and electronics (the country’s largest export category), as well as to slowdowns in global demand (especially from China) and trade protectionism. 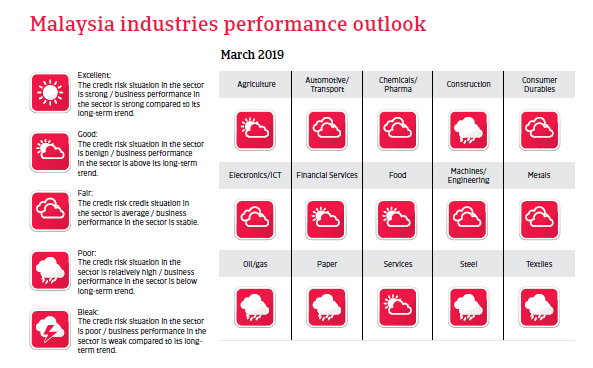 Malaysia´s economic growth is expected to slow down somewhat in 2019 and 2020, mainly due to lower export growth as global demand is weakening, and the cooling down of the Chinese economic cycle. The postponement or suspension of some large long-term infrastructure projects is affecting investment expansion. Domestic demand sustains economic expansion, driven by government consumption and still buoyant household spending. Disposable incomes have increased due to renewed fuel subsidies and the replacement of the GST by a lower sales services tax. However, the impact is expected to dampen in 2019, and higher inflation and rising domestic borrowing rates could lower household purchasing power. The government budget records regular annual deficits between 3.0% and 3.5% of GDP, while public debt amounts to about 52% of GDP. High contingent liabilities due to commitments to state-owned companies and a rising share of debt held by non-residents are vulnerabilities. However, the ringgit exchange rate is supported by persistent current account surpluses and the Central Bank’s rule that 75% of export proceeds must be converted to local currency. Malaysia has a well-developed financial sector, with well-capitalised banks, good credit quality and a low share of non-performing loans (1.5%). However, risk factors are the high level of household debt of about 85% of GDP and a high household income-to-debt ratio of 150%, which could become a problem if interest rates rise substantially. Mitigating factors are the slowdown of credit growth and that private households have large financial buffers, on average.